Much of the story of the unusual watch and clock repair business known as Perfect Time is obvious. It is a standalone former bank drive-through in the Transitown Plaza at Main Street and Transit Road in Clarence, in a parking lot near a pizza parlor, shoe repair shop and nail salon. 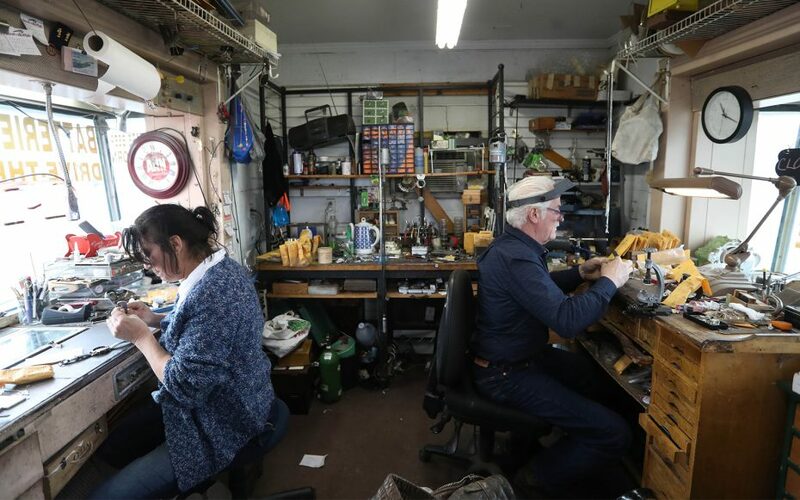 Not much bigger than a full bathroom, the store boasts cuckoo clocks, desk clocks, wristwatches, pocket watches, broken watches harvested for parts and work benches that hold their tools. 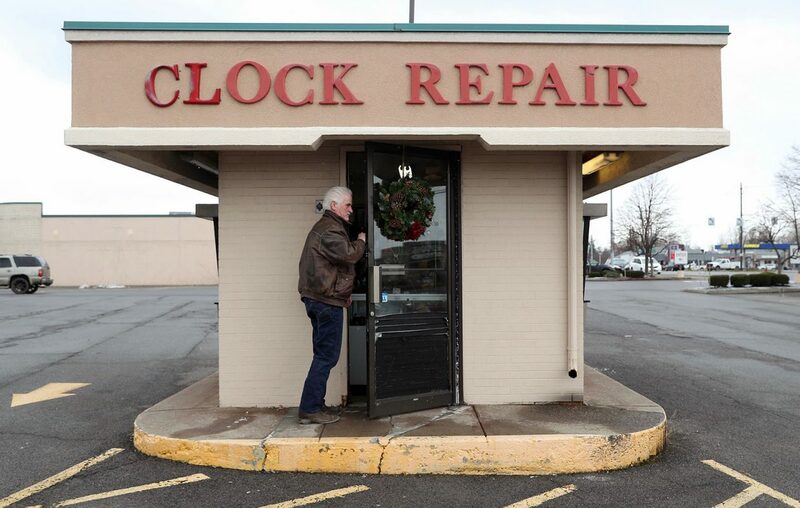 Customers who need help with their timepieces can walk in or use a drive-through window. But the drive-through isn't the only thing that makes the business stand out like a vintage Patek Philippe timepiece. So does the story behind that plaza kiosk and Brooke and Rosa Stanley, the couple who run it. They own a horse farm in Lockport. Brooke Stanley used to offer carriage rides at Canalside. 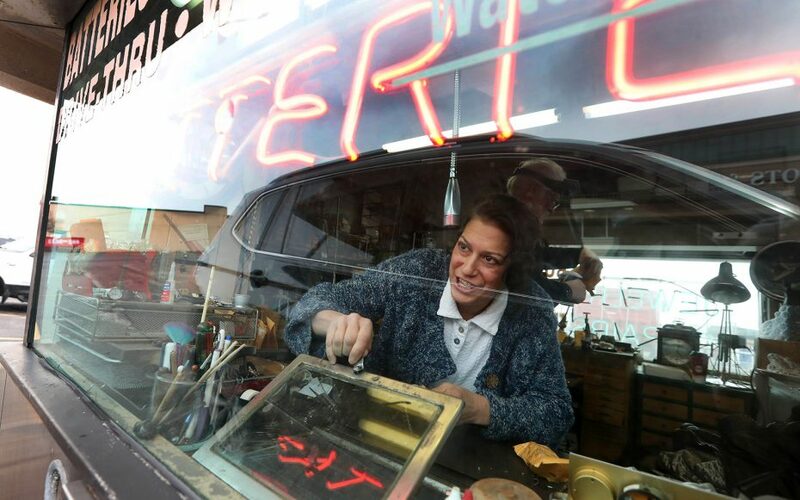 They ran a pawn shop for years in downtown Buffalo. Oh, and this: Brooke Stanley was a paid FBI informant in a murder-for-hire case. And both Stanleys were accused of receiving stolen property at their pawn shop. Both acknowledge past mistakes, but say they want to leave the past behind them. But they're happy to talk about their lives together. "I could tell you stories all day," Brooke said. Brooke Stanley, 58, said he doesn't wear a watch, but he had on two – one on either wrist – on a rainy recent weekday to check that they kept accurate time. “I just always know what time it is. I have thousands of watches. They're everywhere,” Brooke said. “I have clocks – you can't imagine the clocks we have." The Stanleys opened the shop about 16 years ago and work side-by-side, literally and figuratively. They have been married for 29 years and engage in the kind of playful banter common among people who have seen each other at their best and their worst. "That's my first wife, Rosa," Brooke quips. "I never know how to respond to that,” Rosa, 55, replied, “so I just kind of let it go over my head." Brooke, with Rosa joining him in 1992, started out in retail jewelry sales before shifting into repairs. Brooke bought the Perfect Time watch repair business from its previous owner. 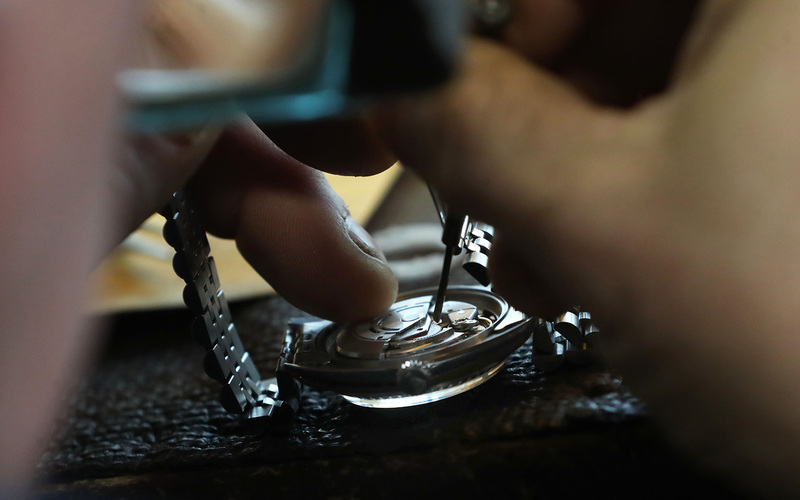 It takes years of schooling and on-the-job practice to repair intricate watch mechanisms and delicate pieces of jewelry. "A lot of hours," Rosa said. As if repairing watches and thinking up wife jokes don’t occupy enough of Brooke Stanley’s time, he keeps busy in other ways. Brooke offered horse-drawn carriage rides at Canalside for several years before stopping last year. "I had no life anymore," Brooke said. The Stanleys own a 150-acre horse farm, in Lockport near the Transit Drive-In, though they have just four horses there. 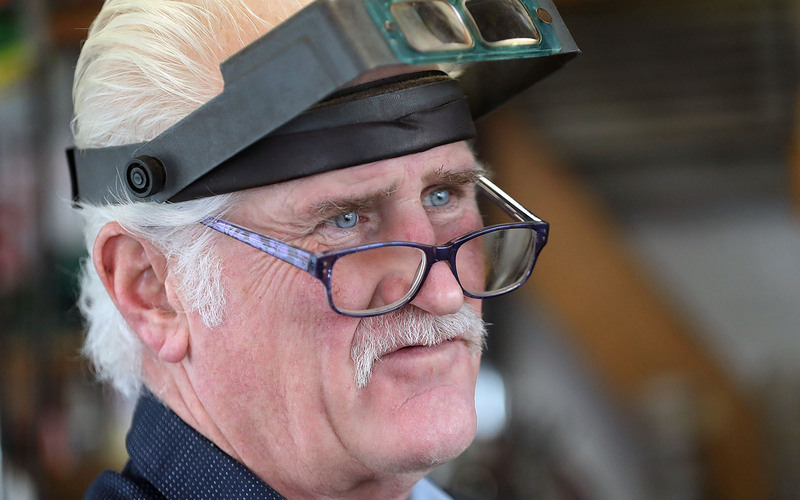 He also creates belt buckles and other items out of metal in a shop at home, including a knife forged from an old railroad spike. But the Stanleys' story was not always about horses and watches and metal work. In 1995, he testified as an informant, after a friend asked him to help find people who would kill his ex-wife’s current husband. Brooke went to the FBI instead and the woman who attempted to hire him was arrested, tried and convicted. Two years later, a civil rights activist led protests outside the Stanleys’ Empire II Pawnbrokers shop in Buffalo, saying the couple discriminated against black customers. Community activist Charley H. Fisher III, who led the protests, at the time called Brooke Stanley a "career criminal." The Stanleys denied any racism and Rosa Stanley was quoted as calling Fisher "garbage." Also in the late 1990s, Brooke was arrested for accepting stolen property at the pawn shop, he pleaded guilty to charges related to a stolen rifle and Rosa was indicted in a computer theft. Both were placed on probation after convictions and State Supreme Court Justice Ronald H. Tills ordered them to liquidate or sell the business. The Buffalo News discovered the criminal cases after interviewing the Stanleys. The Stanleys did not discuss any of the cases in detail. Brooke said about 50 or 60 people come to the shop each day, either through the front door or to the drive-through window. He said people like the convenience and, especially, it works for busy parents who can keep their children in the car while they wait. "It's like McDonald's. They like that," Brooke said. Customers can drop off a watch for a more complicated repair, but wait in their car for a battery replacement. The Stanleys charge about $10 for a Swiss watch battery. 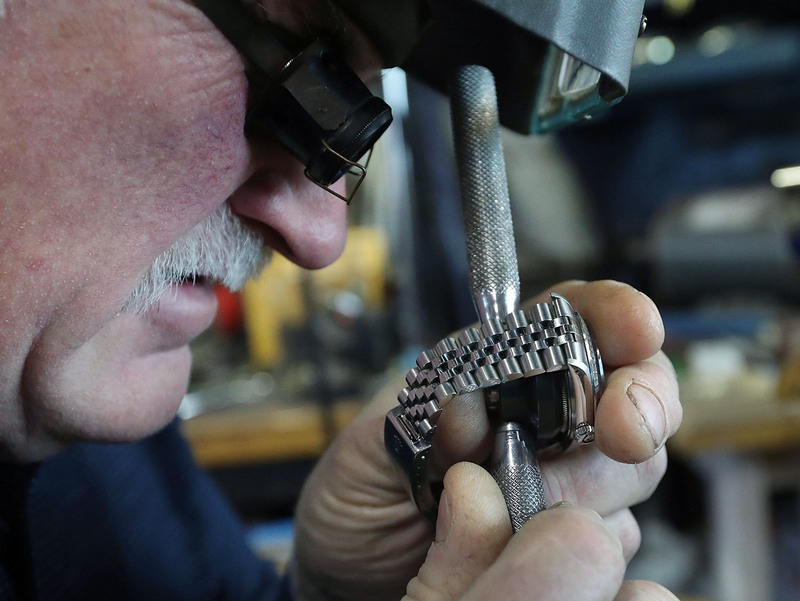 Kim Durak of Snyder takes watches and jewelry, such as a silver charm bracelet, to the Stanleys. Durak said Rosa has replaced her watch battery in as little as two minutes as she waited in the drive-through lane. "Where does that happen anywhere else in the world? Only in Buffalo," Durak said, noting the couple's historical knowledge and their repartee. Brooke said they must read technical manuals to keep up to date on the thousands of watch movements. When repair shop owners retire, or die, the Stanleys often buy their specialized tools. A widow who lived in the neighborhood once came into the Stanleys’ shop to offer them her late husband’s work bench, with tools inside, untouched since 1969. While more people today don’t wear watches, keeping track of time with their smartphones, Brooke Stanley said many customers are collectors who own five, six or more watches. 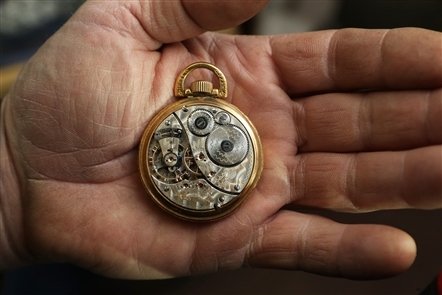 Brooke and Rosa have worked on pocket and wristwatches that are more than 150 years old and that are worth thousands of dollars. They also repair grandfather clocks, which require home visits. "This is a dying art. Not too many people do what they do," Durak said. "My husband said, 'They're a hoot.' "
The Stanleys planned to add cellphone repairs to their repertoire. Asked if he could repair an Apple Watch, Brooke said, "I can fix anything except your marriage."